JALAL AL-DiN RUMI - MEWLANA - - GÜLEFENDİM - [ EN SEVGİLİYE ] İman, Hakikat ve Huzur Yolu..! There are some significant personalities who with the help of their voice and breath, their love and excitement, and their promise for humanity always remain fresh and alive over the course of centuries. Time evidently fails to make these characters obsolete. Their thoughts, analyses, explanations, and spiritual messages, which never will be lost, represent ever new, alternative solutions and prescriptions for today’s social problems, in great variety and diversity. Rumi is one such personality. Despite the centuries that separate his life from ours, Rumi continues to hear and to listen to us, to share our feelings, to present solutions to our problems in a voice that is without equal. Despite the fact that he lived some seven centuries ago, he remains absolutely alive among and with us today. He is a man of light—one who receives his light from the spirit of the Master of Humanity (Prophet Muhammad, peace and blessings be upon him), distributing this light in various ways to just about everywhere. He was chosen to be one of the world’s saints and to be pure of heart; a blessed one whose words are outstanding among those heroes of love and passion. He was and continues to function as Israfil, blowing life into dead spirits. He continues to provide the water of life to the barren hearts of many, a spiritual irrigation. He continues to provide light for the travelers on their paths. He was and continues to be the perfect heir of the Prophet. Jalal al-Din Rumi, a man of God. He hastened toward God on his own spiritual journey, and in addition to this, he evoked similar journeys in countless others—journeys marked by an eager striving toward God. He was a balanced man of ecstasy who sprang alive with love and excitement; he did this to such an extent that he inspired in others these significant feelings, and he continues to do so. In addition to his passion for God and along with his knowledge and love of Him, Rumi further is renowned as a hero in terms of both his respect and fear of God. He was and continues to be one who beckons, one whose powerful voice invites everyone to the truth and the ultimate blessed reality. Rumi was an inclusive master whose joy was a direct consequence of His joy, whose love and passion were the result of His special favors to Rumi. His life provides real evidence of the Truth. While he spoke to those of his own times in an effective manner, Rumi has become even more influential in that he made his voice and breath, which reflected the voice and breath of Prophet Muhammad, peace be upon him, continue to be heard for centuries after. He spoke with such an enchanting voice that he was able to guide not only his blessed contemporaries, but also people of our time, centuries removed from his physical existence. God bestowed upon him this important duty. For this purpose, God blessed him with impeccable inner and outer qualities so that he would prove successful in this undertaking. His heart was full of the Divine Light. As such, his essence is marked by his wisdom, which shines like a light reflected through a precious gem. His innermost self was enveloped with Divine mysteries. His inner eyes were enlightened by this special light. On this horizon, Jalal al-Din Rumi represents the North Star, the heart of the circle of guidance for his time. He embodies the characteristics of the lamp of sainthood, taking its light from that of the truth of the Prophet. Many of God’s blessed creatures are instinctively attracted to light. Rumi’s light has attracted hundreds of thousands of spiritual butterflies; they are drawn to the light. He represents a guide for humanity’s quest for the perfection of human qualities. Rumi was a careful exegete of the truths presented in the Qur’an. A fluent interpreter of love and zeal for Prophet Muhammad, peace be upon him, Rumi was able to use a mysterious language to guide others to a love of God. Those who enter his sphere are able to reach an ultimate sense or feeling in the presence of God. Those who examined the Qur’an by his guideposts underwent changes (and continue to undergo changes) similar to those witnessed by the people who lived in the era of the Prophet himself. When the verses of the Qur’an were interpreted by Rumi’s closest associates, all hearts benefited from the illumination provided by his wisdom; it was as if all of heaven’s mysteries were opened by his wholehearted recitation of that one word—God. Rumi’s love for God was a fiery one, with a constant longing for the mysteries of God. He experienced love and passion both in his solitary asceticism and his activities in the community. It was in his solitariness that he became most open to the truest union with God, and it was during separation from all things except God that his heart burned with fire. And while such a sense of burning would prove difficult for many to bear, Rumi never showed any signs of discontent. Rather, such burning was considered a requirement for passion, and refraining from complaint was seen to be in the tradition of loyalty. For Rumi, those who profess a love of God necessarily must accompany their statement of “I love” with a sense of furious burning—this is the price one willingly must pay for being close to or in union with God. Additionally, one must engage in behavior that is to a large extent ascetic, such as moderate eating, drinking, sleeping, and a constant awareness and orientation toward God in one’s speech, and one inevitably must experience bewilderment when endowed with God’s bounties. Rumi cannot understand how a lover can sleep in an immoderate way, as it takes away from the time that can be shared with the Beloved. For him, excessive sleep is offensive to the Beloved. As God instructed David, saying, “O David, those who indulge in sleep without contemplating Me and then claim to be in love are liars,” so too did Rumi state, “When the darkness falls, lovers become intense.” Rumi continually recommended this not only in words, but also in his actions. I am like Majnun in my poor heart, which is without limbs, because I have no strength to contest the love of God. Every day and night I continue in my efforts to free myself from the bonds of the chain of love; a chain that keeps me imprisoned. When the dream of the Beloved begins I find myself in blood. Because I am not fully conscious, I am afraid in that I may paint Him with the blood of my heart. In fact, You, O Beloved, must ask the fairies; they know how I have burned through the night. Everyone has gone to sleep. But I, the one who has given his heart to You, do not know sleep like them. Throughout the night, my eyes look at the sky, counting the stars. His love so profoundly took my sleep that I do not really believe it ever will come back. If the spirit of the anthology of Rumi’s poems—which are the essence of love, passion, divine presence, and excitement—were to be wrung out, the result would be cries of love, longing, and hope. Throughout his life Rumi expressed love, and in turn, he believed he was beloved because of this. Accordingly, he spoke of his love and relationship with Him. When he did so, he was not alone—he took along with him many blessed individuals who were his audience. He assumed it to be a requisite of loyalty to offer, cup by cup, the drinks presented to him on the heavenly table to others who were in his circle of light. The Buraq of love has taken my mind as well as my heart, do not ask me where. I have reached such a realm that there is no moon, nor day. I have reached a world where the world is no longer the world. The love, relationship, and warmth toward all creation expressed by Rumi are a projection of a deeply-rooted divine love. Rumi, whose nature was intoxicated by the cup of love, embraced all of creation with a projection of that love. He was involved in a dialogue with every creature, and all this was a result of nothing but his deep love of God and his relationship with the Beloved. I believe that these disordered and somewhat confused explanations are far from adequate to describe Rumi. This disorder is an inevitable result of my search for a relationship with him. A droplet cannot describe the ocean, nor can an atom describe the sun. Even so, since his light falls once again on this earth, I would like to say, in a few sentences, some words about Jalal al-Din Rumi. Rumi was born in the city of Balkh in 1207, at a time when all of Asia was suffering from social, political, and military problems. His father, Muhammad Baha al-Din al-Siddiqi, was in the tenth generation of the descendants of Abu Bakr al-Siddiq, the first caliph of Islam. According to Tahir al-Mevlevi, Rumi’s mother was also a descendant of the Prophet. He was the blessed fruit of a hallowed family tree. Being known as the Sultan al-Ulama (the Leader of Scholars), his father was a man of truth and an heir of the Prophet. Like many friends of God, he was persecuted and eventually compelled to migrate. Accordingly, he left the land of Khawarzm, where he was born, and undertook a lengthy journey that encompassed various destinations. First, he and his family visited the Holy Land, the cities of Mecca and Medina. From there, he traveled and remained for some time in Damascus, where he met many pious persons, such as Ibn al-‘Arabi, and exchanged spiritual enlightenment with them. Accompanying his father, the young Rumi, six or seven years of age, witnessed these and other events; his inquisitive senses enabled him to experience all of these with remarkable clarity. The young Rumi understood his environment even at such a tender age, and he was able to penetrate into the secret world of Ibn al-‘Arabi. As an endowment of his presence with Ibn al-‘Arabi, the child received kindness and favors. Despite the unfortunate circumstances surrounding their migration and the many difficulties that accompanied them, the family’s journey provided them with a variety of favors and inspiration. Like Abraham, Moses, and the Prophet of Islam, may God’s blessings be upon all of them, Rumi was able continuously to find these blessings and favors. Welcoming what fate gave him, he became a receiver of numerous bounties provided by God. The journey took this blessed family to the city of Erzincan, and later to Karaman. It was during his time in the latter city that Rumi studied, for a short period, in the Halawiyye madrasa. In addition to this school, he studied Islamic sciences in several religious schools in Damascus and Aleppo. After graduating, he returned to the city of Konya, which he considered his hometown and a place of special regard. It was there that he married Gevher Khatun, the daughter of Shams al-Din Samarqandi. After some time, Rumi’s father, Sultan al-Ulama, died and returned to God. Under the supervision of Burhan al-Din al-Tirmidhi, Rumi began his long spiritual journey. After several years, at the suggestion of Rukn al-Din Zarqubi, Rumi met with Shams-i Tabrizi, who was then on a visit to Konya. It was through his meeting with Shams that he furthered his spiritual journey and eventually developed in to the person who now is known the world over for his spiritual depth. What has been mentioned so far, in fact, represents an attempt to open a few small windows on the life of an exceptional personality in this creation, one whose capacity is open to the lofty world. This is also an attempt to present the life of an important representative of the Muhammadi spirit (i.e., the practice of the sunna)—displaying several snapshots of a man determined to dedicate his existence to the afterlife. It is not my intention to stir the waters that comprise the lives of such remarkable and pure personalities with debates and questions that ultimately only will agitate and obscure. However, one must wonder whether Rumi opened the horizon of Shams or whether Shams took Rumi to the world of the unseen. Who took whom to the reality of realities—the peak of love and joy? Who directed whom to the real Besought and the real Beloved? Answering these questions is beyond the capacity of most ordinary people. One can say, at least, the following: During this period of time, two skillful and acute spirits came together, like two oceans merging into one another. By sharing the divine bounties and gifts received from their Lord, they both reached peaks that most people would not be able to reach easily on their own account. Through their spiritual cooperation, they established camps on the peaks of knowledge, love, compassion, and joy for God. As much as they enlightened those of their own times, they also influenced all centuries to follow, an effect that is still present today. The spring of sweet water that they represent continues to nourish the thirsty. They have been remembered continuously over the centuries for their beautiful contributions to countless lives. Here it is important to note that Rumi was informed by numerous sources in the flow of ideas, including his father, the great master of scholars. During his journey, he seemed to have left many of his contemporaries behind. His love and compassion flowed like the waters of the world’s oceans, so much so that while continuing to live physically among humans, he managed to become ever closer to God. It seems he never elevated himself above others except through his writings, both during his life and after entering eternity; he provides a guiding star that echoes the spiritual life of the Prophet of Islam. Accordingly, he is among the few people who have exerted a great influence through both space and time. 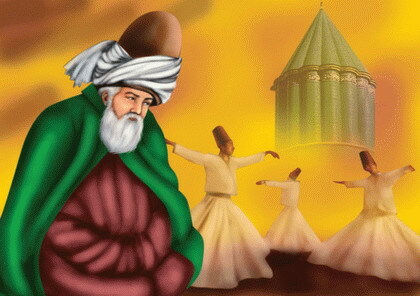 Rumi, the Master, was not a pupil, a dervish, a representative, or master as is known among traditional Sufis. He developed a new method that was colored with revivalism and personal, independent reasoning by taking the Qur’an, the sunna, and Islamic piety as his points of reference. With a new voice and breath, he successfully brought to a new divine table both those of his generation and those of later times. As far as his relationship with God is concerned, he was a man of love and passion. As for those who turn to him for the sake of God, he represents a compassionate bearer of God’s divine cup of love. Yes, as the rains of mercy fall forth from the clouds of the sky, and if the collections of his poems were to be wrung out, God’s love and the love of His Messenger would gush forth in showers. His Mesnevi, exuberant with his spirit, a book that is in part didactic and was put in book form by his disciple, Husam al-Din Chelebi, represents his largest, most monumental treatise. While it stems from his involvement with the floods of a high level love and passion, it was presented in smaller waves so that their essence might be understood by a larger part of humanity who did not share the same capacity. His other work, Divan-i Kabir, is both informed by and presented in this higher level of love and passion and better represents his own abilities. In the Mesnevi, feelings and thoughts are put in such a way that they do not confuse our intelligence and in such a style that it does not surpass our understanding. As for the Divan-i Kabir, everything is like an erupting volcano. Its meaning is not understood easily by most. A careful investigation will show that this great book of Rumi’s thought will explain such concepts as baqa billah maallah (to live by God with God) and fana fillah (annihilation in God) in the context of a larger understanding of the world of the unseen. Those who are capable of realizing this excitement in Rumi’s Divan will find themselves in extreme bewilderment before a flood of love and ecstasy that is comparable to volcanic eruption. In these poems of the master, which are not easily accessible for most people, the limits of reason are surpassed, the meanings of the poems are elevated above the norms for humanity, and the eternal nature of the unseen world shadows the ephemeral colors and forms of what one encounters in their physical being. Jalal al-Din Rumi was nourished by the fruit of numerous sources of ideas, including religious seminaries, Sufi lodges, and Sufi hermitages associated with strict Sufi asceticism. Rumi attained an understanding of the Ultimate Reality. He cultivated the heavenly through his own methods. Eventually, he became a central star, the North Star, in the sky which houses sainthood. He was like a bright moon that rotates on its own axis. He was a hero who reached the places where he should have reached and stopped where he should have stopped. He read carefully what he saw and evaluated well what he felt. He never displayed or participated in any improper behavior during his journey to God. Even though the numbers were vast, Rumi never lost any of the bountiful gifts he received from the world of the unseen, not even to the weight of an atom. Like many of his predecessors, he voiced these divine bounties through his poetry in an impressive manner. He often voiced his love and excitement in seemingly magical words that resembled the finest of precious gems. Within the vagueness of the poetry, he mastered the art of explaining his ambiguous statements in ways that opened their meaning to friends, but remained obscured to outsiders. These statements that were at times both clear and ambiguous are the voice and breath of his own horizon—he was not acquainted with other pens or the wells of ink which supplied them. Although one can find a few foreign words or works falsely attributed to him, Rumi’s anthology represents a warmth, the music of his own heart, a music that brings all who hear it under its influence with a captivating control. Rumi possessed a very delicate disposition, often appearing more compassionate than a mother to her child. In short, he was an exceptional personality, particularly in his projection of the spirit of God’s Messenger in his own time. This is illustrated in his collected works, including the Mesnevi, Divan-i Kabir, some collected letters associated with familial relations, and his special behavior with friends. Those who witnessed this were greatly excited to see the perfect heir of the Prophet and would say with great humility and respect, “This is a grace from God. He gives it to whom He wants” (Maeda 5:54). Rumi was a man of genuine sincerity and loyalty. He lived by what he felt in his heart as long as it did not contradict the teachings and laws of religion. While making his faith the focus of his life, while showing others the way of life, while blowing into the ney, and while dancing like a butterfly, his heart was burning with love and longing; it always ached and sang like the plaintive ney. Those who were not aching could not understand him. Those who were rude and tactless could not feel what he felt. He said, “I want a heart that is split, part by part, because of the pain of separation from God, so that I might explain my longing and complaint to it.” Saying this, he searched for friends who had similar longings and complaints. Throughout his life Rumi witnessed and experienced many difficulties. Yet, he never acted in a harsh manner or tried to hurt others in response. While proclaiming the bounties of God, Rumi roared and was fearless. In his personal engagements, he was always meek and humble, willing and ready to embrace everyone with great compassion. Bad characteristics, such as selfishness, pretentiousness, arrogance, or aggressiveness, found no quarter with him; they could not even come close. He was extremely respectful to all, especially those with whom he had the closest associations: he referred to his friend, Shams-i Tabrizi, the man from whom he lit his own candle, as his “Master”; he called his pupil and spiritual representative, Salah al-Din Faridun, “Spiritual Leader,” “Master,” and “Sultan”; he always mentioned Husam al-Din Chelebi with great respect. His behavior toward his family members mirrored the behavior of the Prophet toward his own family. His community of followers was open to everyone—like that of the Prophet—and he was close to even those who were farthest from him, so much so that his greatest enemies were compelled, unwillingly, to throw themselves upon his compassionate embrace. Once having entered this circle, no one ever abandoned him. On the one hand, Rumi, the Master, had a specific intimate relationship with the world of the unseen, but on the other hand, especially as far as his relationship with people was concerned, he never promoted any sense that he was greatly different; this was because of his utmost sincerity and humility. He lived among the people as one of them. He would listen to them, eat and drink with them; he never would disclose the secrets cultivated between him and God to those who could not truly appreciate their value. Being a guide, he lived by what he believed and always tried to find a way to penetrate the hearts of those around him. He would call his gatherings “Talks on the Beloved,” thus making an effort constantly to draw attention to Him. He would say, “Love,” “Longing,” “Ecstasy,” and “Attraction” to try to share with others the gushing excitement and feelings that were inherent in his spirit. He would show everyone who passed within his sphere the horizon of real humanity. He never allowed his eyes to rest on worldly possessions but rather would distribute any accumulated possession or any money that was beyond his own needs among those who were in need. When food was scarce in his house, he would say, “Thank God as today our house resembles the Prophet’s house.” Accordingly, it was through thankfulness and patience that he made his spiritual flights into the world beyond. Rumi did not accept charity or alms; in this way he was able to avoid a feeling of indebtedness—he suffered from hunger, lived modestly, and yet never would let others be aware of such situations. He did not want to stain his service of guidance for God by accepting gifts or presents. In his inner world, the various waterfalls of love flowed out at a variety of volumes and distances. His sincere approach toward the Divine and his fidelity were rewarded with divine ecstasy and attractions. He was privileged with the greatest closeness to God, and he frequently sipped from the cup of divine love, cup by cup, becoming intoxicated. He wanted to see, to know, to feel, and to speak only of Him and to relate all of his work and words only to Him. He was so earnest in this regard that if his eyes turned to outsiders for even a brief moment, he would sit and cry a great many tears. He strongly desired to live in the spacious environment of togetherness with Him. He convulsively struggled to be both a lover and a beloved and spent the minutes of his life in an intoxication that emanated from both. Many were the lovers who felt these spiritual joys in a similar way and preceded Rumi in life and death. Yet Rumi’s superiority is revealed by the way in which he spoke out so courageously about his feelings and thoughts in his Divan-i Kabir. In fact, since the time of the Prophet and through the periods that followed, there have been many great heroes who have been afforded superiority over Rumi by common consensus. However, Rumi’s superiority lies in a special merit, whereas theirs are more general merits. Therefore, in this regard we can perceive Rumi as the leader of this field, the finest among the fine. Rumi is an outstanding guide in leading people to the Most Beautiful of the beautiful on the path of love. The works of His grace are based on the ability of creatures. While an oyster makes a pearl.